Creative Hands is a contemporary Cape Cod gallery of Fine Crafts and more. It provides local and visiting patrons of Cape Cod a place to view and/or purchase one-of-a-kind handcrafted artwork for everyday use and enjoyment in a formal gallery setting. The Gallery features the works of an eclectic cross section of both established and emerging artists: glass blowers, jewelry makers, potters, wood turners, furniture makers, print makers, photographers, painters, sculptural artists and more. Each piece of artwork is displayed in a manner so as to give it space to be viewed and enjoyed individually. 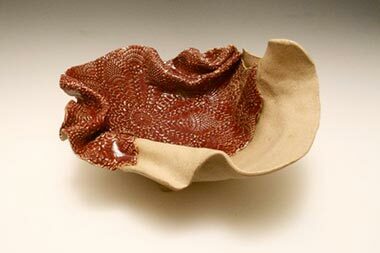 Jim Irvine, the owner of Creative Hands Gallery, is a long time potter. Having grown up in Lincoln, Rhode Island, and having attended art school in Providence, he participated in many Fine Art and Craft Festivals throughout the years. The next logical step in his career was to open a Fine Art and Craft Gallery, giving him a place to show his own work as well as that of other very talented artists he's met at the various craft shows, and throughout his life.